Have you tried my recipes so far?If yes do you a pic clicked?Kindly mail me or message me those images and I will be extremely to have them in my space. When you are super bored of cooking and you still want to make your lunch nutritious you can go ahead with one pot meals. Here is one yummy,sweet and spicy version of one pot meal and it doesn’t require much time for cooking. This can be an easy way to include veggies to your toddlers menu. They will love it because of the colours and taste of carrot. If your baby is weaned by BLW method I am sure you will get an empty bowl back. My aunt had made this when we visited them 2 months back and we were totally loving it. 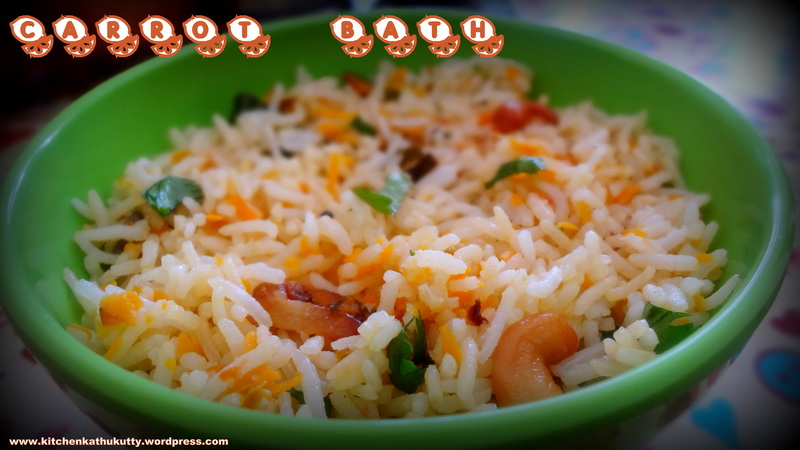 1.Wash and soak basmati rice for 20 minutes in luke warm water. 2.Add 1.5 cups of water and pressure cook the rice or open cook the rice and strain excess water. 3.Fluff the rice with a fork and set it aside. 4.In a pan,add ghee and roast cashews and set them aside. 6.Keep tossing until onions turn golden brown. 7.Now add the rice and mix well. 9.Garnish with coriander leaves and cashews. This is very suitable for kids who love colours in their foods. Take care to fluff the rice well with a fork and ensure they don’t stick together. You can also replace carrot by beet root. You can use the normal rice instead of basmati rice too. Ensure not to stir many times after step 7. Otherwise the rice will turn mushy. This is suitable for babies above 9 months of age. Avoid salt and replace basmati rice with usual rice if required. You can serve with any raitha of your choice. Adjust the spice level by adding or reducing the GGG paste. You can also add other seasoning elements like aniseeds,cinnamon,baby leaf and clove.